Earlier in our involvement with Touch, Timo and I held a workshop with Alex Jarvis (currently at moo.com) and Mark Williams (now at Venture Three) to explore notation for RFID and the actions hidden in the readers. One of my favourites that emerged from the day was this one. It shows how far we were reaching for metaphorical handles – around which to characterise the technology, relying on the verbs associated with the result of the interaction: to Pay, to Open, to Delete etc. Physically the systems are very different and are more frequently represented by their envelope packaging, like the Oyster card. 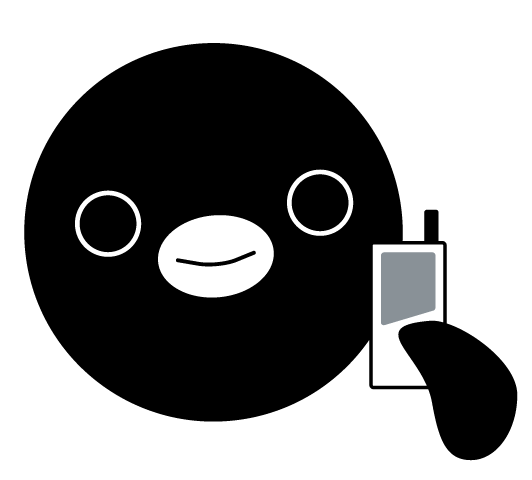 Branded systems have chosen to use characters, my favourite is the Suica Penguin. During the visualisation work, the cross sections in the readable volumes that emerged began to feel very strong visually. They capture an essential nature in the technology which is difficult to unearth with symbols based on metaphors. Timo and I experimented with forms which have an almost typographic nature ranging to a more strictly geometric shape. We settled on this most geometric version. It would be terrific to see this picked up and used as a symbol for the technology in public. A CC licensed pdf of the ‘geometric’ can be found in the Touch vaults. This image is a photographic mapping of the readable volume of a radio field from an RFID reader. The black component in the image is an RFID reader, similar to the component inside the yellow part of the oyster card reader. The camera has been fixed in its position and the reader photographed. Using a tag connected to an LED we paint in the edges of the readable volume with a long exposure and animate them to show the form. Following Nearness, the chain reaction film, is Immaterials: The ghost in the field, our next film with Timo Arnall at the Touch project. There are 4 billion RFID tags in the world. They may soon outnumber the people. Readers and tags are increasingly embedded in the things and environments in which we live. How do readers see tags? When we imagine RFID and their invisible radio fields, what should we see? Immaterials explains the experiments we have performed to see RFID as it sees itself. It is incredible how often RFID is seen as a long-range ‘detector’ or how little relevant information is contained in technical data-sheets. When this information is the primary material that we are working with as designers, this is highly problematic. By doing these kind of experiments we can re-frame the technology according to our experience of it, and generate our own material knowledge. There is a sequence in the video where I briefly discuss the directionality of tags. Most tags (and therefore their antenna) are flat. They have a direction. The shape of the readable volume changes according to the antennas orientation to the reader. The following image shows two volumes. The first visualised with green LEDs shows the readable volume from interactions between a reader and a tag parallel to it; the second, visualised with red LEDs, shows the volume produced by the same tag held perpendicular. Two very distinctive and different shapes can clearly be seen. It is not the radio field produced by the reader itself we are looking at. That is much, much larger. The images show the volume in which the energy in the space surrounding the reader is inducing a current large enough to wake and run the RFID chip at the end of the antenna in the tag. The readable volume can be mapped around a tag or inside the field produced by a reader component, but it only exists between the two. Having produced these visualisations, I now find myself mapping imaginary shapes to the radio enabled objects around me. I see the yellow Oyster readers with plumes of LED fluoro-green fungal blossoms hanging over them – and my Oyster card jumping between them, like a digital bee cross-pollenating with data as I travel the city. We work with traditional materials and fabrication for our product and industrial design, but the exciting contemporary products of our age are more than the sum of their materials, those poorly bound knots of plastic and silicon in our hands and homes. Matt Jones described what we do as ‘Post Industrial Design.’ Perfect! Where once industrial design was concerned with radii, form, and finish, we now deal in behaviours, experience, shifting context, and time. The products we design now are made with new stuffs. Service layers, video, animation, subscription models, customisation, interface, software, behaviours, places, radio, data, APIs and connectivity are amongst the immaterials for modern products. Immaterials are the new substrates for opportunity and risk in product design. Next week, Immaterials: Unravelling the antennae. Last week Timo and I finished filming and editing Nearness. Earlier in the year BERG was commissioned by AHO/Touch to produce a series of explorations into designerly applications for RFID (more to come on what that means). Over the coming weeks BERG will be sharing the results of the work here and on the Touch blog. The film Nearness explores interacting without touching. With RFID it’s proximity that matters, and actual contact isn’t necessary. Much of Timo’s work in the Touch project addresses the fictions and speculations in the technology. Here we play with the problems of invisibility and the magic of being close. The work refers fondly to the Fischli and Weiss The Way Things Go film and its controversial offspring The Honda ‘Cog’ commercial. There are of course any number of awesome feats of domestic engineering on YouTube. Japanese culture has taken the form to its heart. My favourite examples are the bumpers in the kids science show Pythagora Switch. Here’s a clip. Our twist is that the paired objects do not hit or knock, they touch without touching. Last Thursday I began teaching third year graphic design students at Central Saint Martins College of Art and Design in Holborn, Central London. I’m teaching a group of nine with an old colleague of mine James King. James and I have each written a brief, I’ll post them both here and any exciting results that emerge from the students. The brief is set against an introduction to the technology and is conjunction with Timo Arnall‘s Touch project. 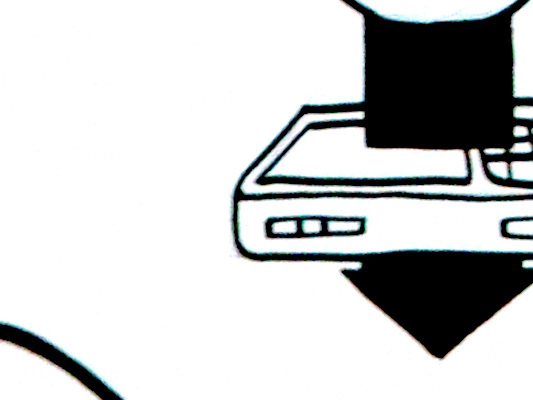 Click the image to download the RFID brief as a pdf and the text to follow. If you have any ideas, solutions or comments yourself, please feel free to add your thoughts to the comments. To think functionally. 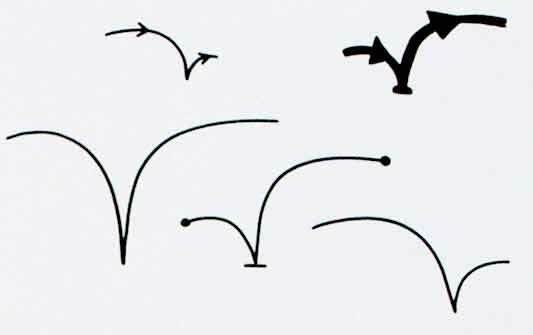 To develop a sense of how signs can work across different contexts with specific meaning. 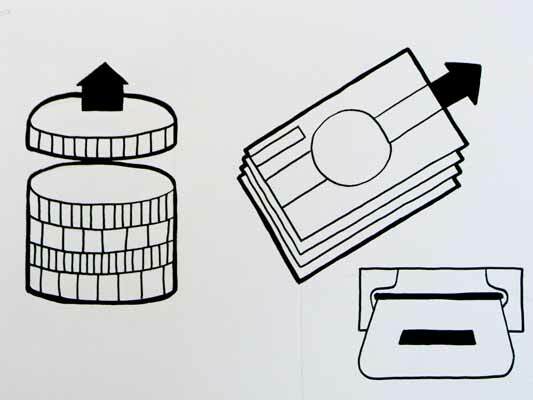 Design an icon or series of icons to communicate the use of RFID technology publicly. 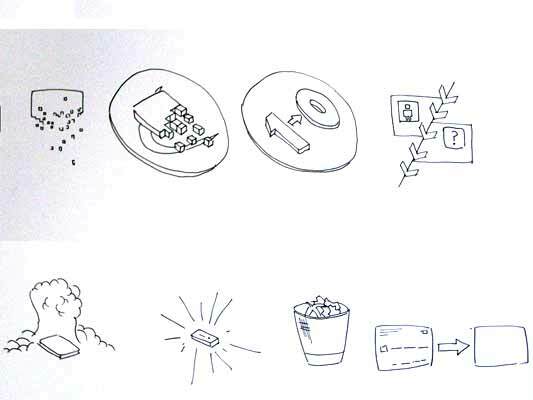 Think about how the icon should represent the physical act of activating an RFID tag. This technology works when the RFID tag is brought near the RFID reader. 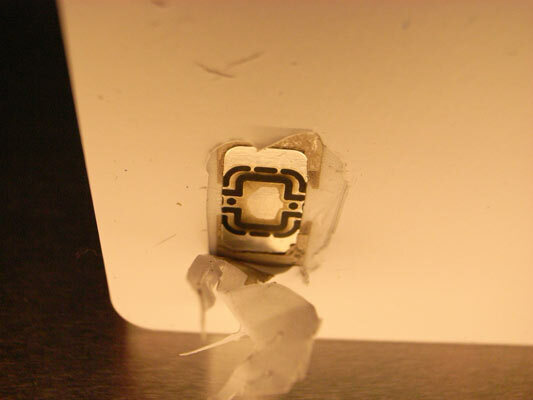 It is important to show how the RFID tag should be used. One of the ways London Transport manage this is to repeatedly broadcast “remember to always touch in… and out with your Oyster card” over their public address system, their logo also represents an image of the card moving in an arc, the logo being printed on the surface of the reader. When you swipe the RFID a transaction will take place. This is true in nearly all situations. I want you to develop icons which represent the verb that takes place when the tag is activated. Purchase. Your account will be deducted when you swipe. Imagine your switch card was a digital wallet, and you could use RFID instead of chip and PIN. 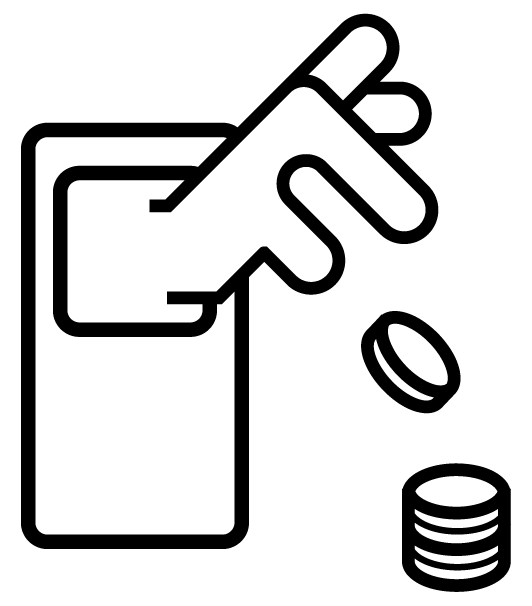 How would you communicate, that when you swipe, you will be charged. Identify. If you go through this gate your details will be read and known, you could think about a passport. Enter, but one way. If you pass through this door you will not be permitted to leave by it. Think about security at airports. Download. Imagine your phone had an RFID inside it and when you wave your phone at a reader, a file is downloaded to your phone, perhaps a local map. Phone. Imagine if when you waved your phone at the reader, it phoned someone, perhaps a helpline or someone specific. Destroy. If you used the RFID to store sensitive data, and you wanted to delete the data, like from a memory stick, swiping the RFID will erase the data on the stick. There might be secondary verbs like Open, or Start. Lifts might require people to identify themselves before they gain access to certain floors. Tickets are often purchased inorder to access certain areas, like with Oyster cards. This is important too, think about how you can combine verbs in the system you develop. The icons should be universal as possible, so English language or culturally specific meaning could make the icon obscure to some people. Think about the context of the reader, does this icon go on doors, busses, airports etc? 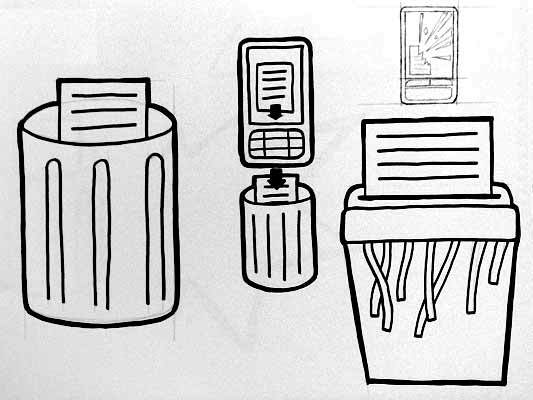 Design sketches: For Thursday 23rd at 9am bring the following: 40 sketches with assorted ideas for Act, Verb and Brand. The sketches should be good, not widdly little drawings in a sketch book, make sure the drawings can be seen clearly at a distance. Also, the design should be good, not bad. So try to make it good. Research: Look at signage and icons in the world and think about how they communicate acts and verbs. Bring in some examples that have influenced your work. The RFID hacking workshop last week was both thoughtful and productive. I’m going to scoot through what we made and a few of the ideas, and leave any more detailed thoughts for other posts. Passive tags have an antenna and a small chip. The RFID reader sends a burst of power at the tag; the power runs through the antenna and powers the chip; the chip does something (maybe just loads an ID, or perhaps does a tiny calculation); the tag sends the data back to the reader and powers down. It might have a little memory too–perhaps 0.5-4Kb. Active tags are as passive ones, but with a battery. …but, essentially, the basic thing we’re using is a loop of wire that somehow reports the same number each time when you ring it with an electromagnetic field generated by the reader. In the palm of each white glove (Jack and I both have one) is an RFID tag. Inside the white polystyrene box is an RFID reader hooked up to a microcontroller (on an Arduino board). The board is also hooked up to a vibrating motor. When you put your hand near the block, it begins to rumble. On my glove – I’m on the right of the photo – is a flex sensor, wired up to the controller. The more bent the sensor, the bigger the rumble of the box. So when you approach the reader with an open palm, there’s a gentle vibration. As you make a grabbing gesture, the vibration grows and the white box begins to lead about. It makes a fair racket. Jack was keen on celebrating the magic of this kind of remote action. What if the vibrating motor was actually a toy car motor? You could approach a car, and push it with your glove, imbuing it with acceleration through empty air. By clenching your fist, it’d zoom faster! You’d have to chase it to keep it moving. With two gloves and two motors, you could control it too. Are proximity and tensing the hand the correct interactions for these kind of toys? We can only think by making. This last point was a revelation to me. RFID interactions are not like button-pushing interactions. With buttons, the smarts are behind the buttons themselves. The buttons trip relays and activate switches. With RFIDs, the smarts are all in the thing you use to push the buttons. Imagine a computer keyboard, but the keyboard isn’t plugged into anything. Instead, cameras in your fingertips read the letters on the keys, decipher them, and send those letters via a USB cable in your wrist to the computer. That’s more like RFIDs. With buttons, the button pusher is the fungible bit (any finger can be a poking device) and each button is special. With RFID, the button pusher needs to be clever. Continuing this thought, imagine a keyboard which worked like this. You’d print out paper ones that were better for Quark or Photoshop or whatever. You’d draw ad hoc macro keys on the desk, in erasable pen. Taking this back to RFIDs, does their true potential only emerge when people can make and write their own copy-tags to fill their environments? On the third day, we came back to where we’d started on the first day: Trying to get a feel for the field of an RFID reader. Jack and Timo spent time in the workshop at the Architecture School making a robot pen to do the same thing. This pen has an embedded RFID tag (Timo’s photo again). 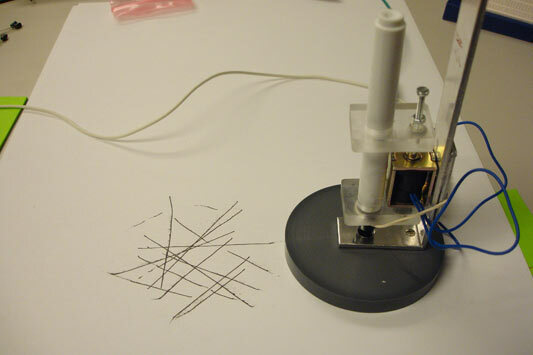 It’s wired to the RFID reader, which controls a solenoid pushing the pen up and down. The pen is only down, and drawing, when it’s within range of the reader. You slide it around, and the automation does the rest. 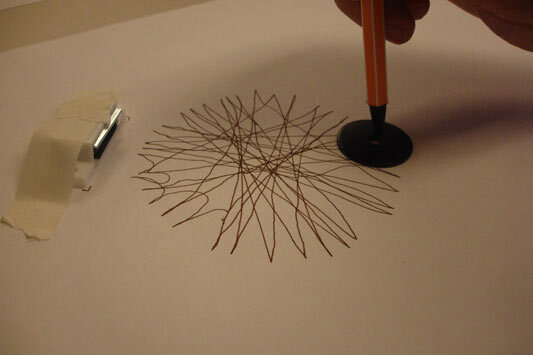 The machine-aided drawings aren’t as beautiful as the totally hand-drawn ones, but ain’t that always the case. It’s great to look at early designs, when buttons were still brand new, and folks were still coming to terms with an action that could trigger an arbitrary amount of work. 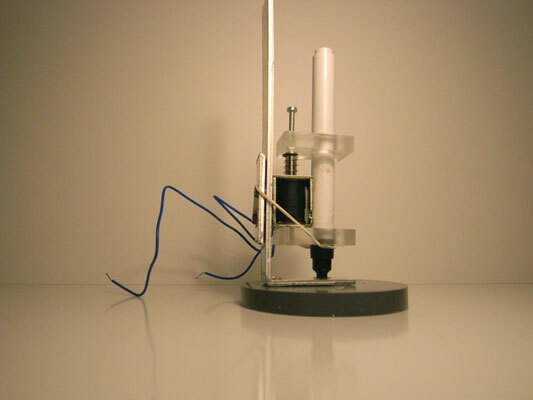 We think of a button press as the work itself, launching the missile or punching the letter, whatever, not simply completing the circuit that joins the actual cause (mechanical or electrical energy) to the effect. The button has become a by-word for easy. The 1960s sci-fi books I’ve read, when they want to express the maximum amount of crazy future thinking, talk about relays: devices that convert a button press to an action in a circuit that can do anything at all. Yet we barely think about relays now, or how incredible buttons are. When did buttons stop being modern? I really enjoy collections of single design elements. 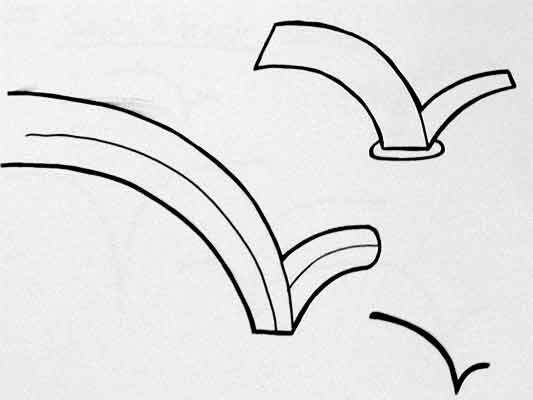 Timo Arnall has written The dashed line in use, making the (dashed line) connection between his use of this element in indicating RFID interactions and how it occurs in instruction manuals, paths, graphs, as ellipsis… He also talks about how the line indicates a seam, a visible join between two things that still maintains the two things as separate. The dashed line for RFID is doubly appropriate first because the field is invisible and, second, because the indicated interaction hasn’t happened yet–it exists only in potential. Is there a dashed line to be drawn between Timo’s work and the history of the button?